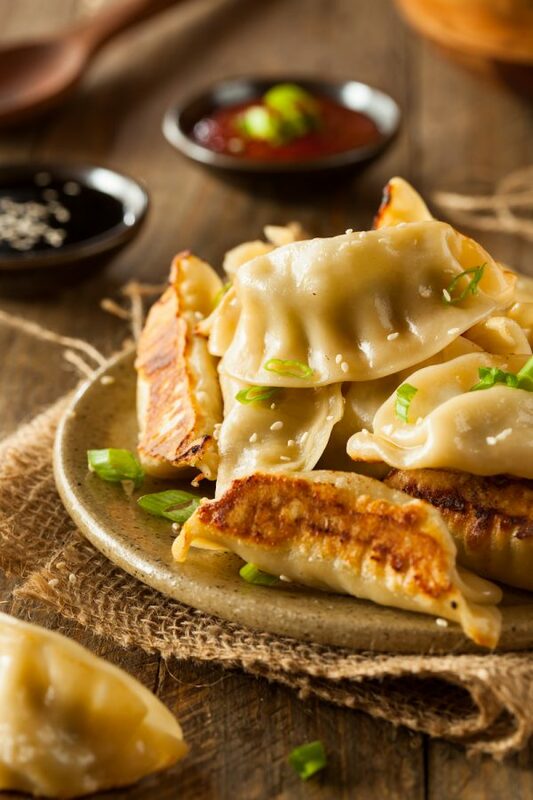 One of your favorite take out foods, Chinese Dumplings (also commonly known as potstickers), are easy to make and taste much better when you make them homemade! Hi, my name is Jessica and I am addicted to Chinese Dumplings, or as you might also know them, Potstickers! Those little crispy pan fried bottoms and perfectly steamed filling/tops? Better get a double order of them, because I am eating them all! But this shouldn’t be a surprise to any of you, seeing as my other favorite dinner includes dumplings as well. Anyone remember my famous Chicken and Dumplings recipe?? 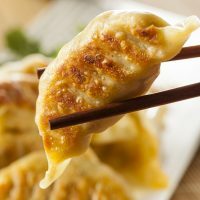 Well guess what, I’m back with another fabulous dumplings recipe! This one is just Chinese instead of American! We love to order Chinese take out a couple of times a month when I need a night off from cooking dinner and pork potstickers are always on our menu. Our whole family will actually fight over the last one! So I figured it was high time I learned how to make our very own Chinese Dumplings at home. I am going to be honest with you…while I do make my own Chinese Dumpling pork filling, I usually do not make my own homemade wonton wrappers for the dumplings. Should I? Probably. Especially if you want to be more authentic! 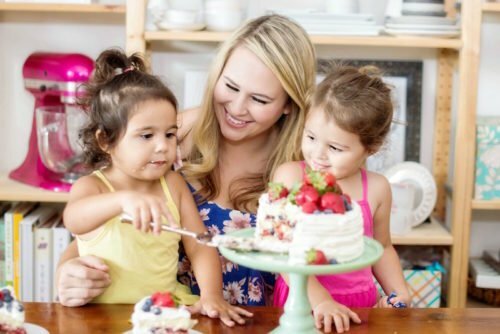 However, I do not have the patience or time for that with three kiddos running around. If you would like to go all out, I recommend this recipe for the homemade wrappers from Steamy Kitchen. They are great! If you are like me and would like to use store bought wrappers, I use Nasoya round wonton wrappers. In my local grocery store, they are sold in the refrigerated produce area and come in a large package. With the round wonton wrappers, you add the filling and fold them in half and pinch the edges together. Super simple folding skills needed. This is the style that are most commonly seen from most Chinese take out restaurants when you order potstickers. If you can not find the round wonton wrappers, don’t fret! The square ones are just as good. I promise they taste exactly the same! Just fold them into a triangle and then fold in the edges to make a little purse, just like I showed in the photos above. Chinese Dumplings are easier to make than you might think. You start by mixing the pork filling together and placing the filling in the center of the wrapper. Use your finger to wet the edges of the wrapper and seal it tightly. Then you have a few options for actually cooking them. You can pan fry, steam or boil your dumplings. 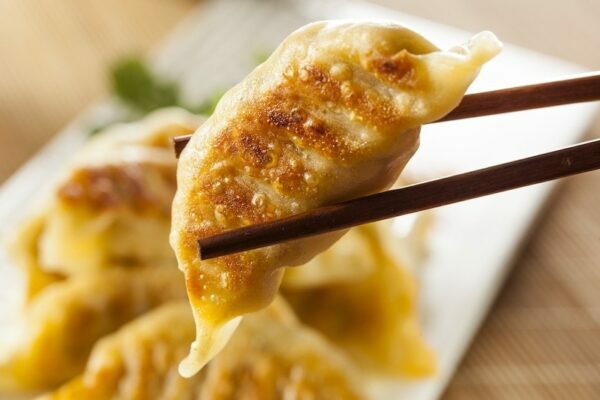 If you pan fry your dumplings or simply steam them, they will be what are commonly called potstickers. Or, you can boil your Chinese Dumplings in a broth based soup to create wonton soup! 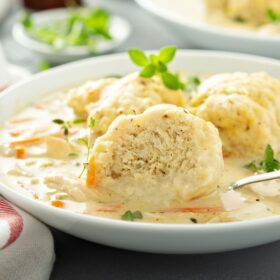 You may want to try your hand at my famous Chicken and Dumplings recipe! 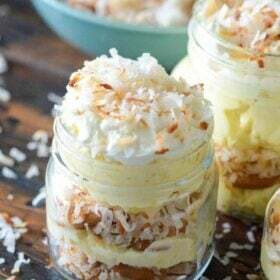 I promise it’s truly legendary and one of my most popular recipes ever! Or, I even have a couple of sweet dumpling recipes: Rum Apple Dumplings or Mountain Dew Apple Dumplings! For these potstickers, I prefer to use a 100% pork and vegetable filling. 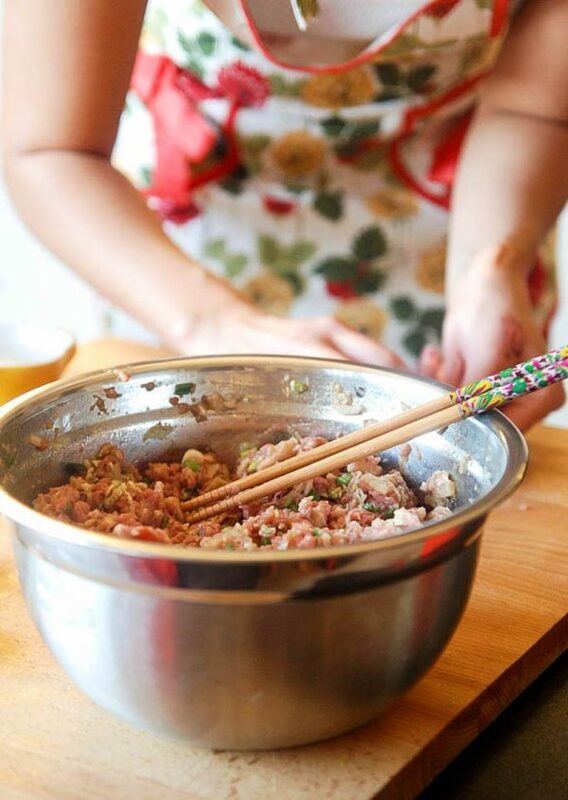 I utilize ground pork, cabbage, green onions, shiitake mushrooms, bok chop, bamboo shoots and fresh ginger to give our dumpling filling an amazing depth of flavor. However, if you would like, you can swap the pork for ground turkey or chicken and they will still be tasty. Another fun option is adding 1/2 cup finely chopped raw shrimp to the ground pork mixture. 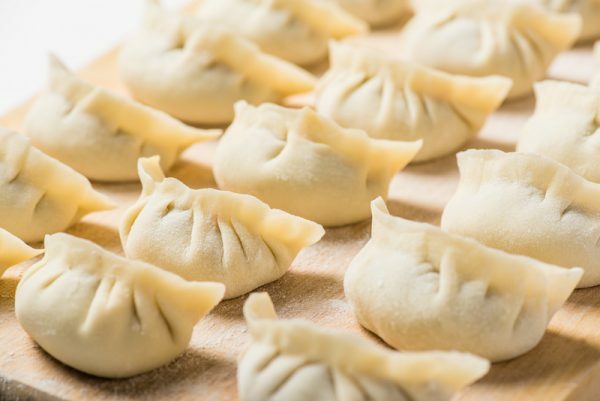 Try them with different combinations to discover your family’s favorite and make this Chinese Dumplings recipe your own! These Chinese Dumplings are one of my absolute favorite recipes to make with my kids. They love to help fill and wrap the wontons. Lyla is always begging to make “the little presents” as she calls them! I also included directions on how to freeze your dumplings in the recipe. They freeze great and make an easy quick freezer meal! In a large bowl, combine all pork filling ingredients until well combined. You will need a clean workspace, wonton wrappers, prepared pork filling, a small bowl of water, and chopsticks. 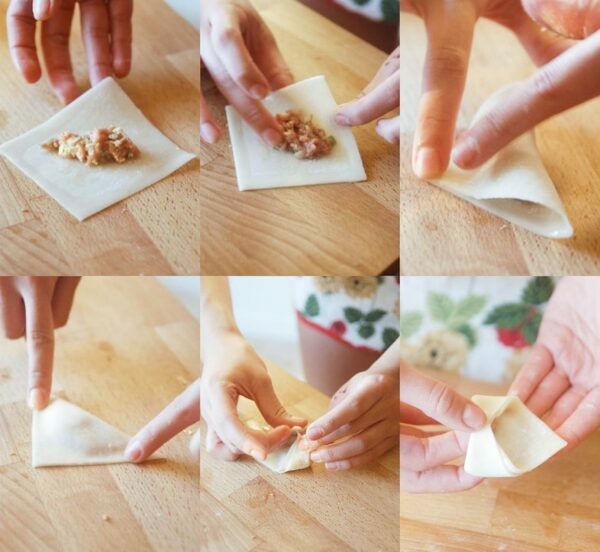 Begin by filling the wonton wrapper with about a tablespoons worth of pork filling. Wet your finger, and run along the edges of the wonton wrapper. This will help to seal it closed. If your wrapper is round, fold the wrapper over the filling to create a half-moon shape, pinching the edges to seal. If you wrapper is square, scroll up to view the step by step images of how I fold my dumplings into a little purse dumpling. Once you have filled the dumplings you can freeze them or eat them fresh. Place the dumplings in a single layer on a cookie sheet and freeze for about 30 minutes. Then place in a ziplock baggie, where they can be frozen for up to 3 months. Heat a large skillet over medium high heat. Add 2 tablespoons of vegetable oil to the skillet and place dumplings in an even layer. Fry for a few minutes until bottoms are golden. Add 1/3 cup of water and cover with a tight fitting lid. 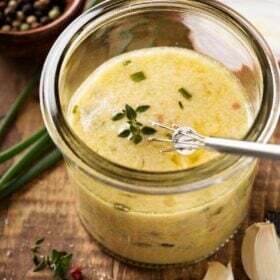 Cook until the water has boiled away and then uncover and reduce heat to medium or medium low. Let the dumplings cook for another 2 minutes then remove from heat and serve with soy sauce and thinly sliced green onions. Place dumplings in a steamer basket on a single layer of cabbage leaves or a piece of parchment paper and steam for about 8 minutes. If you enjoyed this recipe, make sure and check out my Crockpot Sesame Chicken and Teriyaki Shrimp Stir Fry! Next Post » Arrrr Matey! 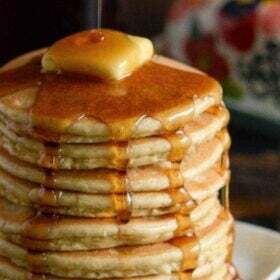 Yummy, when I have some free time I plan to try this! Thanks for sharing; love the photos! These look very good. I love the idea of freezing them and adding them to soup later. I am very upset over this, where are your big girl chopsticks? I’m hoping that next time I see one of the asian recipies, as an honorary asian being that my new last name gives me the power, I think you should use them. 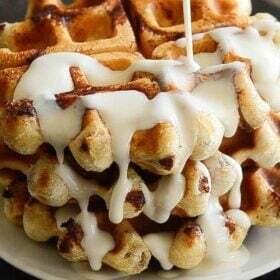 But about this, they do look delicious! I’m about to start a section like this in mine too! It’s good to have a place to share things, right? 🙂 I love it! Wow! Great job on this post. Your pictures are awesome! I love finding ways to make my favorite take-out dishes at home! It’s so much less expensive…both calorie wise and money-wise. 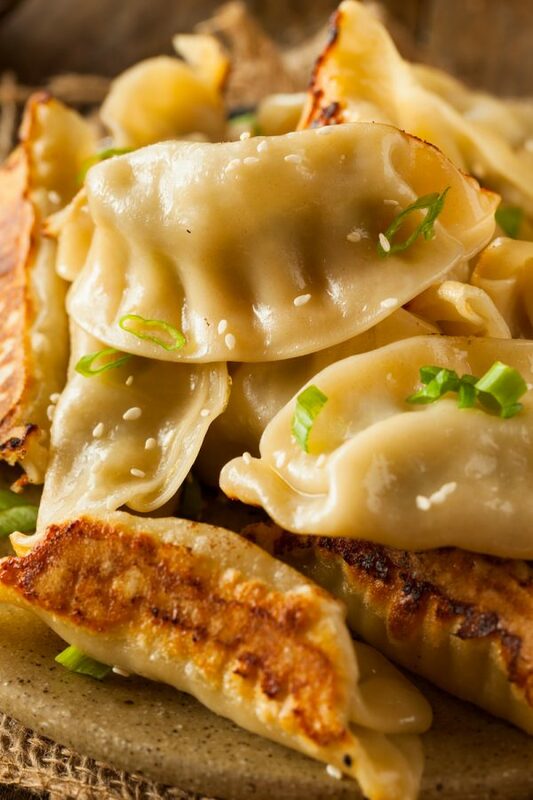 These dumplings sound delicious and like they taste WAY better than their take-out counterpart! You really have a fearless nature in the kitchen, Jessica. Then again, these don’t seem as difficult as I first imagined they would be! Thanks, as always, for sharing another eye opening recipe and beautiful photos. Chinese dumplings are awesome… I’ll have to try this recipe. If I can find the wonton wrappers somewhere, that is. Classy little wontons, well done. My God., that must have been a shocker to find out your fave take out cost you so many calories…, well done for not stepping in those waters again (not sure if I would be strong enough to give them up forever). What gorgeous photos! I’ve never made dumplings before but they’re on my list 🙂 I do love making take out treats at home for the exact same reasons – cheaper $ and calorie wise and usually just as tasty! 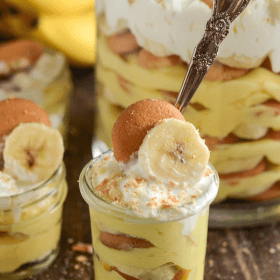 Yum and I always thought these would be so hard to make…My eyes instantly laser focused on your vintage looking apron…Love it too.I’m not seriously cooking, baking or doing housework without one of my trusty aprons !